As the Oilholic conjectured at the end of 2010, the year 2011 did indeed see Brent Crude at “around US$105 to US$110 a barrel”. However there was nothing ‘crudely’ predictable about 2011 itself – the oil markets faced stunted global economic growth, prospect of another few quarters of negative growth (which may still transpire) and a Greek crisis morphing into a full blown Eurozone crisis. The Arab Spring also understandably had massive implications for the instability / risk premium in the price of crude over much of 2011. However, the impact of each country’s regional upheaval on the price was not uniform. The Oilholic summarised it as follows based on the perceived oil endowment (or the lack of it) for each country: Morocco (negligible), Algeria (marginal), Egypt (marginal), Tunisia (negligible), Bahrain (marginal), Iran and Libya (substantial). Of the latter, when Libya imploded, Europe faced a serious threat of shortage of the country’s light sweet crude. But with Gaddafi gone and things limping back to normal, Libya has awarded crude oil supply contracts in 2012 to Glencore, Gunvor, Trafigura and Vitol. Of these Vitol helped in selling rebel-held crude during the civil war as the Oilholic noted in June. Meanwhile Iran remains a troubling place and gives us the first debating point of 2012. It saw protests in 2011 but the regime held firm at the time of the Arab spring. However, in wake of its continued nuclear programme, recent sanctions have triggered a new wave of belligerence from the Iranian government including its intention to blockade the Straits of Hormuz. This raises the risk premium again and if, as expected a blanket ban by the EU on Iranian crude imports is announced, the trend for the crude price for Q1 2012 is decidedly bullish. Société Générale's oil analyst Michael Wittner believes an EU embargo would possibly prompt an IEA strategic release. The price surge – directly related to the Saudi ability to mitigate the Iran effect – would dampen economic and oil demand growth. Market commentators believe an EU embargo is highly likely, especially after it reached an agreement in principle on an embargo on January 4th. However, a more serious development would be if Iran carries out its threat to shut down the Straits of Hormuz, disrupting 15 million bpd of crude oil flows and we would expect Brent prices to spike into the US$150-200 range albeit for a limited time period according to Wittner. “A credible threat from missiles, mines, or fast attack boats is all it would take for tanker insurers to stop coverage, which would halt tanker traffic. However, we believe that Iran would not be able to keep the Straits shut for longer than two weeks, due to a US-led military response. The disruption would definitely result in an IEA strategic release. The severe price spike would sharply hurt economic and oil demand growth, and from that standpoint, be self-correcting,” he adds. Nonetheless, not many in the City see a “high” probability of such a step by Iran. Anyway, enough about Iran; lets resume our look back at 2011 and the release of strategic reserves would be a good joiner back to events of the past year. Political pressure, which started building from April 2011, onwards saw the IEA ask its members to release an extra 60 million barrels of their oil stockpiles on to the world markets on June 23rd. The previous two occasions were the first gulf war (1991) and the aftermath of Hurricane Katrina (2005). That it happened given the political clamour for it is no surprise and whether or not one questions the wisdom behind the decision, it was a significant event. For what it was worth, the market trend was already bearish at the time, Libya or no Libya. Concerns triggered by doubts about the US, EU and Chinese economies were aplenty as well as the end of QE2 liquidity injections coupled with high levels of non-commercial net length in the oil markets. On the corporate front, refineries continued to struggle as expected with many major NOCs either divesting or planning to divest refining and marketing (R&M) assets. US major ConocoPhillips' announcement in July that it will be pursuing the separation of its exploration and production (E&P) and R&M businesses into two separate publicly traded corporations via a tax-free spin-off R&M co. to shareholders did not surprise the Oilholic – in fact it’s a sign of times. Upstream remains inherently more attractive than the downstream business and the cliché of “high risk, high reward” resonates in the crude world. Continuing with the corporate theme, one has to hand it to ExxonMobil’s inimitable boss – Rex Tillerson – for successfully forging an Arctic tie-up with Rosneft so coveted by beleaguered rival BP. On August 30th, 2011, beaming alongside Russian Prime Minister Vladimir Putin, Tillerson said the two firms will spend US$3.2 billion on deep sea exploration in the East Prinovozemelsky region of the Kara Sea. Russian portion of the Black Sea has also been thrown in the prospection pie for good measure as has the development of oil fields in Western Siberia. The US oil giant described the said deal as among the most promising and least explored offshore areas globally “with high potential for liquids and gas.” If hearts at BP sank, so they should, as essentially the deal had components which it so coveted. However, a dispute with local partner TNK-BP first held up a BP-Rosneft tie-up and then finished it off. The Oilholic saw M&A activity in the oil & gas sector over 2011 – especially corporate financed asset acquisitions – marginally exceeding pre-crisis deal valuation levels. Recent research for Infrastructure Journal – suggests the deal valuation figure for acquisition of oil & gas infrastructure assets, using September 30th as a cut-off date, is well above the total valuation for 2008, the year that the global credit squeeze meaningfully constricted capital flows. Finally, on the subject of the good old oil benchmarks, since Q1 2009, Brent has been trading at premium to the WTI. This divergence has stood in recent weeks as both global benchmarks plummeted in wake of the recent economic malaise. WTI’s discount reached almost US$26 per barrel at one point in 2011. Furthermore, waterborne crudes have also been following the general direction of Brent’s price. The Louisiana Light Sweet (LLS) increasingly takes its cue from Brent rather than the WTI, and has been for a while. Hence, Brent continues to reflect global conditions better. Rounding things up, 2011 was a great year in terms of crude reading, travelling and speaking. Starting with the reading bit, 2011 saw the Oilholic read several books, but three particularly stood out; Daniel Yergin’s weighty volume - The Quest, Dan Dicker’s Oil’s Endless Bid and last but not the least Reuters’ in-house Oilholic Tom Bergin’s Spills & Spin. Switching to crude travels away from London town, the Oilholic blogged from Calgary, Vancouver, Houston, San Francisco, Vienna, Dusseldorf, Bruges, Manama and Doha; the latter being the host city of the 20th World Petroleum Congress. The Congress itself and other signature events in the 2011 oil & gas calendar duly threw up several tangents for discussion. Most notable among them were the two OPEC summits, the first in June which saw a complete disharmony among the cartel’s members followed by a calmer less acrimonious one in December where a unanimous decision to hold production at 30 million bpd was reached. On the speaking circuit front, 2011 saw the Oilholic comment on CNBC, Indian and Chinese networks, OPEC webcasts and industry events, most notable among which was the Baker & McKenzie seminar at the World Petroleum Congress which was a memorable experience. That’s all for the moment folks. Here’s to 2012! Keep reading, keep it 'crude'! © Gaurav Sharma 2012. 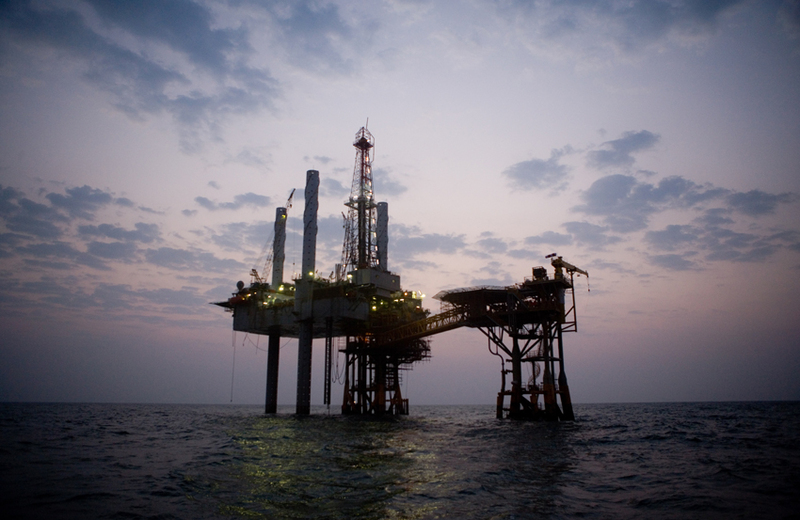 Photo: Oil rig © Cairn Energy.